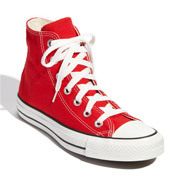 This Chuck Taylor hi-top sneaker is a true classic. It’s been around for decades and is not going to go out of style any time soon. Especially not in an all-round versatile colour like this red version. They’re a fun way to try out the 2013 sassy sneaker trend. Check out these tips on how to wear them with a sophisticated edge. Add an insole for cushioning comfort. Also available in black, black monochrome, navy, optical white, white, pink and a ton of other colours. Have a squizz at these if you like the classic Converse but can’t handle a completely flat sneaker. The baby wedge provides a nice lift, and is very on trend. Pop in an insole for extra comfort. Fab with all types of jeans and pants. Fun and fashion forward with frocks and skirts. These sneakers run small, so you may need to go up a size. Also available in black, red and navy. This relaxed leather sneaker with perforation detailing and contrast stitching has a chic sporty vibe. 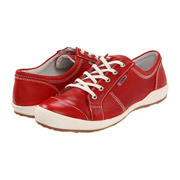 It’s a fun shoe that comes with a cushioned, removable leather footbed, the leather lining helps wick away moisture. Try these if Converse are not your thing. Available in eight versatile colours.